The album will be initially released digitally and on streaming services with plans for CD and vinyl to be announced soon. 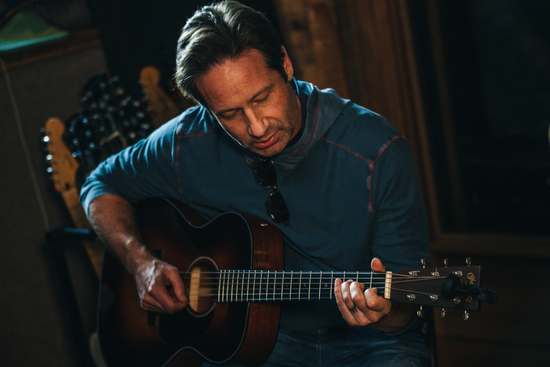 It is surprising to know that David Duchovny only picked up a guitar a few years ago in a spell of free time, between projects, at first just to amuse himself but as he started playing, felt inspired to start writing songs. He grew up listening to classic late 60’s early 70’s rock: The Beatles, The Who, Rolling Stones, Yes etc… along with a lot of funk which he aspires to play, joking he’ll need to become a better musician to do so. David Duchovny is best known as an award winning actor, director and novelist starring in the smash TV series The X-Files (winning a Golden Globe for the role.) His first novel Holy Cow was released by Farrar Straus and Giroux in February 2015 and hit the New York Times Best Sellers’ list. This was followed up by his second novel, Bucky F*cking Dent, which also hit the New York Times Best Sellers’ list, and was released globally in 2016. In 2015, David completed his first studio album for for ThinkSay Records titled Hell or Highwater touring both Europe and the US in support. David reprised his award winning role as Fox Mulder January 3rd on The X-Files. His third book, Miss Subways, will be released globally in May of 2018, and David is planning on Directing and Producing his novel, Bucky F*cking Dent into a film summer of 2018. He also plans to hit the road in support of his new album, first in Australia and New Zealand in February with U.S. plans to be announced soon.